A 62-year-old female patient with advanced rheumatoid arthritis was admitted for assessment of disease activity. Patient was currently under treatment with Tocilizumab and Cyclosporine A (3mg/kg). Her history of hepatitis C and elevated transaminases (treated with Methotrexate) rendered her ineligible for this standard therapeutic option. Several other DMARDs (Azathioprine, Sulfasalazine, Hydroxychloroquine) and biological therapies (Etanercept, Certolizumab) had proven ineffective. On admission, patient reported increased morning pain and stiffness of hand joints. Clinical examination revealed fourteen swollen joints with no tenderness at compression and typical signs of advanced rheumatoid arthritis: ulnar deviation of fingers, interosseous muscle atrophy, swan neck deformity, impaired prehension. Laboratory investigations showed normal CRP (1.83 mg/L) and slightly increased ESR (44 mm/h) values. DAS28-CRP=2.7 (low activity), DAS28-ESR=4.12 (moderate activity). Hand and wrist radiographs were characteristic of advanced stage disease: bone erosions, joint spaces narrowing, metacarpophalangeal subluxations, juxta-articular osteoporosis. 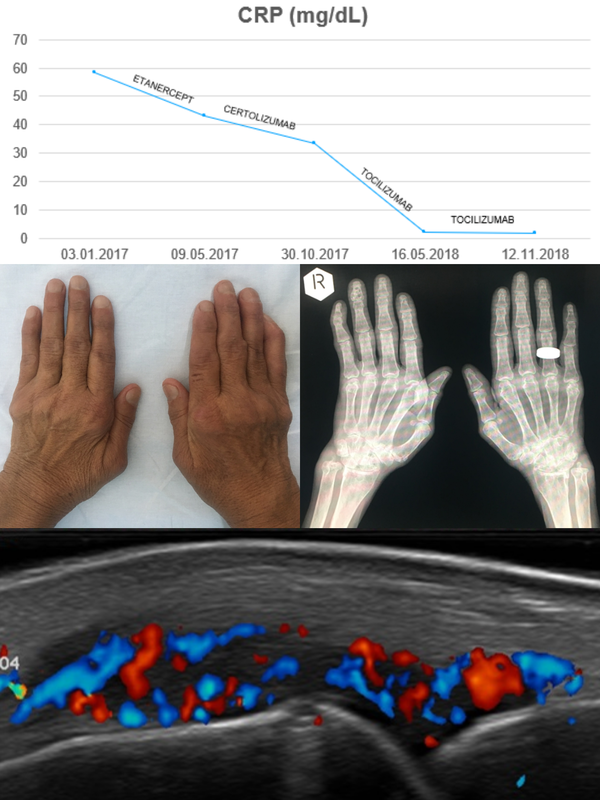 Ultrasound of hand joints revealed signs of active disease with positive Doppler signal. During hospitalisation the patient received pain relieving treatment (Dexamethasone, Lornoxicam). On discharge, Cyclosporine A dose was increased to 5mg/kg. The timeliness of a different biological treatment will be assessed after 3 months, in case of persistent disease activity. The present case highlights the risk of disease activity undervaluation in patients undergoing biological therapy with interleukin-6 inhibitors if the standard DAS28-CRP score is used ,,, due to their additional inhibitory effect on hepatic CRP production. It is advised that in such cases, articular ultrasound and DAS28-ESR score should be considered for a more accurate assessment.